Peter Scott did an indepth and honest review/guide of Frskys long range system and I think is well worth a read I've pasted the review below. only FrSky is offering 900 MHz kit in the UK. However the manuals are very brief and lack essential information, so I was left to find things out myself with some valuable help from RCLife and RobotBirds. It is too soon even for forums to have much useful information. I only found out about the new band when I bought a new Taranis transmitter. As a special offer it came with a free external R9M module to fit into to the module bay in the back. I think this frequency is the result of lobbying by the drone industry. 2.4GHz probably doesn’t give enough range for commercial drone use. Three transmitting powers are available on 868: 25, 200 and 500 mW. This compares with the Taranis 2.4 power of 60 mW, though now you can legally use up to 100mW. However if you want to use telemetry only the 25 mW power can be used. Again I assume this is a pointless EU intrusion. It is also more evidence that the frequency is for drones, as a distant, possibly commercial, drone needing the higher powers would have its own return channel for data. So what starts out looking like a bonus for us from drones turns out to be less revolutionary if we want telemetry, at least in the EU. However there are still benefits. I decided to buy a receiver to try it all out. I got the full-size R9 model with the usual range of servo, S.BUS and SmartPort telemetry ports. It is about the same size as the X8R receivers that I usually use and weighs 16g, but is rather more expensive at £46.95. Binding and custom failsafe is as easy and as good as on the X8R. The two aerials are floppy on the stubs and of course longer. There are two other receivers of reducing size and weight with the lightest being just over 1g. Manuals for all of these are elsewhere on my site. The first step is to ensure that your transmitter has the latest OpenTx software. At the time of writing this is V2.2.2 dated 25 May 2018 though V2.2.1 will work. 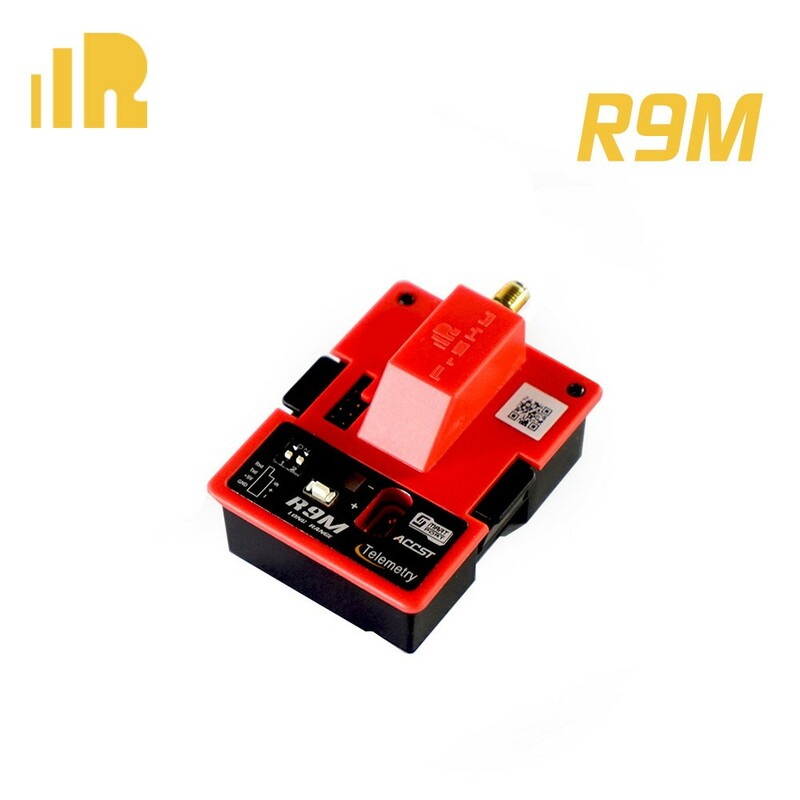 With V1.6 the R9M module will not show up in the transmitter’s list. For details about how to do this read my Taranis manual on www.peterscott.website under Flying. One symptom of out-of-date firmware is that the servos do not move smoothly but jump in larger steps, so it is best to do the updates at the start. On the Taranis you can have both the internal and an external module active, though not at the same time. You select which you want to use for each model, not for all models. I removed the cover on the module bay and pushed in the R9M module. You must stick to the standard NiMH internal battery, or at most a 2S lipo, as a 3S lipo will give too high a voltage. The aerial screws onto a standard radio frequency SMA connector and looks a little weak. Best to take a lot of care not to strain it. I remove mine to go in the Tx box. Suppliers like Farnell stock a wide range of 868MHz aerials if you fancy a change or even more aerial gain. ‘Failsafe button’ for PPM mode. Then bind the receiver in the usual way. 25mW Ch1 – 8 Telem ON. 16 channels. However I haven’t had a chance to try that out yet. Once I had updated the transmitter, module and receiver firmware the receiver bound in the usual smooth and quick Taranis way. You can just replace an existing X8R with an R9 with no changes needed. I plugged it all up and it worked, including telemetry. Prior to updating the firmware the servos behaved in a jerky manner, with response delays. If you change mode, say from 25 to 500 mW you have to rebind. 2.4GHz 60mW. The result was much better than expected. I flew the 1.5m model to what I would normally think of as a visual distance limit, probably about 1km, and the RSSI was still in the mid 90s. When flying closer it stayed on 100. One drawback is the 200mm length of the receiver aerials. One can easily be laid horizontally in most fuselages but the second one is more difficult and there is no firm guidance as to best routes. Apparently it doesn’t have to be at right angles and the Rx might work with only one. On the Bixler I taped the second one to the leading edge of a wing but it could be poked into holes in the wing root ribs in future models. Another drawback is the possible need for an external battery if the internal one runs down too quickly in high power mode. Even with a flat form 2S lipo it means using a transmitter tray. The R9M module is labelled ACCST which is also the protocol used for FrSky 2.4GHz. There seems to be no agreement on the forums about the safe number for transmitters switched on simultaneously, though ten appears to be a rule of thumb. Unless the usable number of channel frequencies on 900MHz is more limited there should be no difference from 2.4. It is difficult to discover how many channels are available but channel separation seems to be 250kHz on 868 and 1MHz on 2.4. If you know better please let me know. One slightly disconcerting fact is the the 868MHz band is also used for such things as remotes for garage door openers, though they will be of very limited power and range. I wondered how I might use this new kit. When might any of us need it? If you are flying FPV with a spotter, using either a drone or fixed wing, you might need the higher power. If you are a visual fixed wing flyer you are unlikely to need the greater range. So the only time it might be useful is if the 2.4 GHz band becomes congested or your field suffers interference from other types of 2.4 transmission. Or of course you might just want to show off how modern you are. What me? The aerial (No! Not ‘antenna’, as I am only half American) is longer and distinctive so it will spark curiosity. Overall I am very impressed. Once again, ‘well done’ to FrSky.